A Russian Soyuz MS-02 spacecraft carrying NASA astronaut Shane Kimbrough and Russian cosmonauts Sergey Ryzhikov and Andrey Borisenko nears the International Space Station ahead of docking in this still image from a video camera on the space station captured on Oct. 21, 2016. The newest space station crew has arrived at last. NASA astronaut Shane Kimbrough and Russian cosmonauts Sergey Ryzhikov and Andrey Borisenko docked with the International Space Station at 5:52 a.m. EDT (0952 GMT) this morning (Oct. 21) after a smooth two-day trip aboard a Russian Soyuz spacecraft. The trio launched into orbit early Wednesday, nearly a month later than their initial Sept. 23 liftoff target due to a technical issue with their spacecraft. 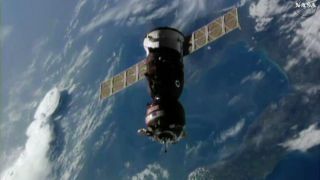 The three crewmembers will be able to open their hatch to the space station by approximately 8:35 a.m. EDT (1235 GMT), when they will be greeted by Russian cosmonaut Anatoly Ivanishin, the space station's current commander; along with NASA astronaut Kate Rubins and Japanese astronaut Takuya Onishi. The hatch opening and greetings, along with the new arrivals' first chance to talk with their families back on Earth, will be streamed live here on Space.com, courtesy of NASA TV. The three new crewmembers will remain on the station until February, and their first few days will be busy ones. Beyond adapting to life in microgravity, just two days after their arrival, Orbital ATK's Cygnus supply spacecraft will arrive at the station, bringing more than 5,100 lbs. (2,300 kilograms) of supplies, according to NASA. NASA astronaut Shane Kimbrough and Russian cosmonauts Sergey Ryzhikov and Andrey Borisenko arrived at the International Space Station Oct. 21, 2016 after a two-day journey on the Soyuz MS-02 spacecraft. Here, they pose with their Sokol launch and entry suits Sept. 9. The supply spacecraft launched Oct. 17 but took a long route to the station to avoid conflicting with the crew's arrival. After Onishi and Rubins grapple the spacecraft with the station's robotic arm, Canadarm2, and berth it to the station, the astronauts will begin the long unloading process. "We look forward to all those vehicles arriving [and] taking them on the space station," Kimbrough said at a news conference in July. "It's kind of like Christmas every time one shows up, because there's a bunch of fresh food and new clothes and new equipment for us to work on." They won't have to share those supplies for long: Less than a week later, on Oct. 29, Rubins, Onishi and Ivanishin will head home on the Soyuz spacecraft they arrived on in July, and Kimbrough will take over as space station commander. On Nov. 15, NASA astronaut Peggy Whitson, Russian cosmonaut Oleg Novitskiy and European Space Agency astronaut Thomas Pesquet will launch toward the station. The crew will also entertain a Russian Progress supply spacecraft's arrival and a Japanese HTV craft full of supplies before the end of the year.